I'm sorry I couldn't be more precise but it was a long time ago. I can remember drinking 6 bottles of champagne, 1 bottle of Vodka and 1 bottle of brandy between us, then being driven back to Sheffield feeling very ill to play at Baileys the following night. So it does have it's memories as vague as they may be. They changed their name to the Fabulous Temptations and came to this country to take advantage of the Soul boom. 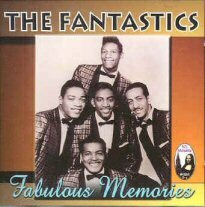 When the now famous Motown group hit the charts another name change was in order and they became The Fantastics. The following are notes that I've managed to glean through searches around the web. There really isn't a lot and if anyone has any more info we'd be delighted to have it. William Forrest's son Ron is trying to put together information on his father and his time with the band. consisted of Jerome Ramos, John Cheetom, Donald Heywood, Richard Pitts and Charles Moffet and later (1968) they decided to change the name to the Fantastics and try their luck in England. William "Sonny" Forrest - Died 2-23-2003 in Tallahassee, Florida, U.S. ( Doo-Wop ) Born 11-13-1936 - Singer - Was a member of The Fantastics (They did, "There Goes My Love" and "I Want To Be A Millionaire Hobo"). The Velours were originally from the Bedford-Stuyvesant section of Brooklyn and although they never scored any major chart hits, they are fondly remembered for their variety of vocal group romantic ballads, novelty numbers, and up-tempo jump and rockin' songs. Original members tenor Jerome "Speedo" Ramos," John Cheetom (first tenor), Donald Heywood (second tenor), Kenneth Walker (baritone), and Marvin Holland (bass) came together in the mid-'50s and began recording for the newly formed Onyx label in June of 1956. Their first single, "My Love Come Back," (1956) failed to hit. In the spring of 1957, the group issued their biggest record, a ballad called "Can I Come Over Tonight." Other singles included during the late '50s included "Blue Velvet," "This Could Be the Night," "Romeo," "Remember," and "Crazy Love." In 1957, Holland and Walker left; they were replaced by Charles Moffitt and baritone John Pearson. This new line-up carried the Velours through their Onyx days. From 1958 on to 1961, the group moved over to Cub and added either Troy Keyes or Keith Williams as an additional tenor, making them a sextet. One album was issued by the group: Remember With the Velours (Onyx 201). The Velours recorded into 1961 before disbanding, only to reform as the R&B-flavoured Fantastics in 1968. This act continued into the early '70s before calling it quits.